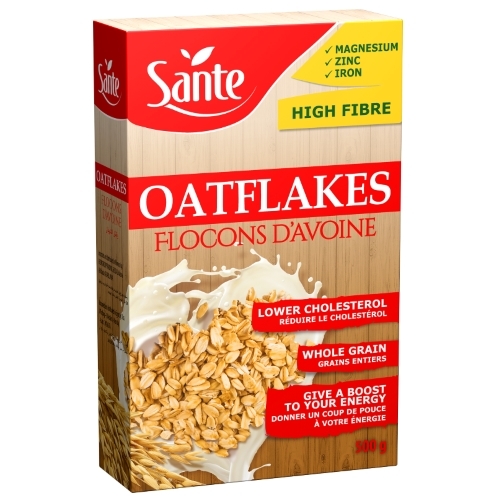 Oat flakes are rich in fibre (6.9g/100 g of the product). They also contain beneficial beta-glucans, which help reduce blood cholesterol and triglycerides. It is this very soluble fibre fraction that distinguishes oat from other grains. Additionally, oat flakes are a valuable source of vegetable proteins (very high protein content when compared to other grains). By eating products rich in oat fibre, you regulate your blood glucose concentration*. Oat flakes are an important element of a well-balanced and diversified diet, recommended for those who lead an active life, do sports and want to enhance their mental abilities. They may be used as the basis of a popular porridge (with milk or yoghurt and fruit), fritters, cookies, cakes, bread, sauces, pancakes or roasts. *Combined with a balanced, diversified diet and healthy lifestyle. May contain traces of peanuts and other nuts, sesame, soy and milk.